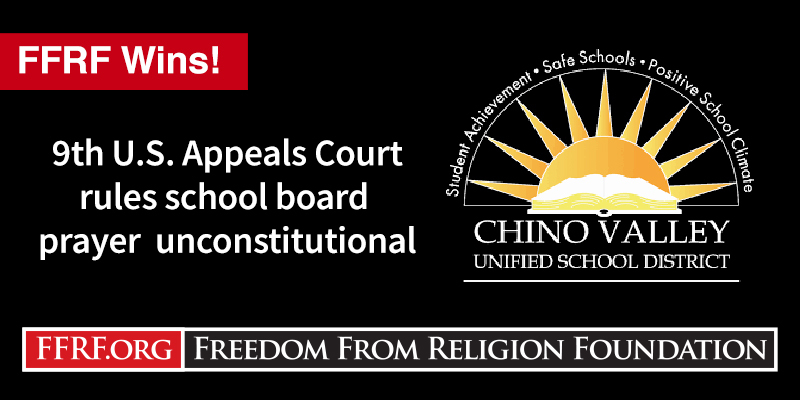 The praying, proselytizing and bible-reading school board in Chino Valley (Calif.) voted to respect the First Amendment and minority rights by not appealing a major Freedom From Religion Foundation victory to the U.S. Supreme Court. FFRF, with 22 local parents, students and employees of the Chino Valley School District, triumphed in July before the 9th U.S. Circuit Court of Appeals (the largest in the country) against prayer at Chino Valley School Board meetings. These meetings, which resembled church revivals more than public gatherings, opened with prayer and regularly included board members reading from the bible and proselytizing. “The board’s prayer policy and practice violate the Establishment Clause,” a three-judge panel of the 9th Circuit had ruled unanimously. The appeals court reaffirmed FFRF’s victory last month by denying a petition to rehear the case. The display of sectarian religiosity at board meetings was brazen. Then-Board President James Na injected Christianity into many of his official statements to parents and students at meetings. For instance, at one such meeting, Na “urged everyone who does not know Jesus Christ to go and find Him,” after which another board member closed with a reading of Psalm 143. “These prayers typically take place before groups of schoolchildren whose attendance is not truly voluntary and whose relationship to school district officials, including the board, is not one of full parity,” the appeals court had ruled. The previous school board, pressured by a local megachurch to which three members had belonged, had voted 3-2 to appeal the decision. The three-judge panel of the 9th Circuit was not impressed: “The prayers frequently advanced religion in general and Christianity in particular.” And in an acknowledgment of the presence of nonbelievers in California, the court also emphasized how discriminatory the prayer practice was toward secular local residents. Bernal had ordered the school board to pay more than $200,000 for the initial case. Costs and fees associated with the appeal ran to $75,000 for a total of more than a quarter million dollars. The Freedom From Religion Foundation is a national state/church watchdog organization that has 31,000 nonreligious members and several chapters all over the country, including almost 4,000 members and a chapter in California.